. استمتع بالخدمات الراقية والضيافة التي لا مثيل لها بهذا الفندق في Whitsunday Islands. إن واي فاي مجاني في جميع الغرف, مكتب الاستقبال على مدار الساعة, مرافق مخصصة لذوي الاحتياجات الخاصة, واي فاي في المناطق العامة, خدمة صف السيارات هي جزء فقط من الخدمات التي تميز Hamilton Island Beach Club Resort عن باقي الفنادق في المدينة. استمتع بوسائل الراحة الراقية في الغرف أثناء إقامتك هنا. بعض الغرف تتضمن تلفزيون بشاشة مسطحة, اتصال لاسلكي بالإنترنت, مسبح خاص, اتصال لاسلكي بشبكة الإنترنت (مجاني), غرف لغير المدخنين لمساعدتك على استعادة طاقتك بعد يوم طويل. يقدم الفندق مجموعة رائعة من الخدمات كمثل حوض استحمام ساخن, شاطئ خاص, مركز للياقة البدنية, ساونا, ملعب جولف (ضمن العقار)، لجعل إقامتك تجربة لا تنسى. مهما كانت دواعي سفرك فإن Hamilton Island Beach Club Resort هو خيار ممتاز لإقامتك في Whitsunday Islands. Although the Beach Club is at the luxury end of the budget, it you want beautiful surrounds and attentive friendly staff to look after you then this is the place. lovely small resort right on the beach, pool is small and right near the restaurant so it's a bit confronting and the rooms are small but it is all tastefully decorated and has a nice vibe. Breakfast special was great each day and staff very friendly and well trained. Clean big room with good service, nice cozy lounge, great service especially free water to private beach. Hamilton Island Beach Club Resort on the surface was quite pricey but they had one night for free because we stayed for four nights. The staff will greet you at the airport and take your luggage and drive you back to your hotel where you are welcomed with a drink and nibblies. The staff at this hotel are very friendly and appear more than happy to help you enjoy your stay. Our rooms were cleaned very thoroughly each day. Guest receive free shuttle services to anywhere around the island 24/7 on golf buggies during the day and comfortable cars/vans at night. Every room has a beach front view. The pool is heated and is private to hotel guests only. There is a free library and office area where you can use the computers to access the internet. Rooms also had free wifi. The complimentary daily breakfast was very good. They have a different special each day. 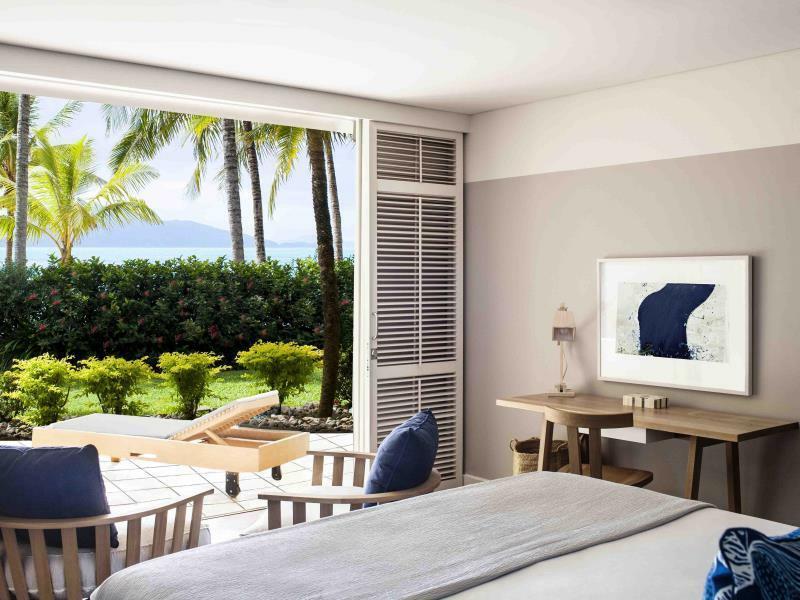 Overall we would go back to Hamilton Island Beach Club Resort despite the price as we felt very well looked after and relaxed during our stay even if it was raining for 4 days out of 6 that we were there. the staff are available when you want them but give you space to carry on with your stay at your own pace. was lovely, although feels a little tired for the premium of night. possibly unfair to compare, but had just spent the weekend at qualia and the difference was significant. yacht club restaurant was outstanding - romanos - very disappointing. we loved walking straight from our room onto a private beach with sun chairs. the restaurant food was good and the service fantastic. personal shuttles meant we weren't waiting around for transport although everything was within an easy walking distance anyway. the rooms were nice & roomy & private. great pool and beach location, fabulous restaurant. On arrival we were struck by the beautiful and lush tropical gardens. We were greated with a cold tropical fruit drink and finger foods.Our room was clean but was not spacious.Overall the rooms were a bit tired, the resort itself was nice and set right on the beach. Kinda small, with only one restaurant for all day use. I liked this hotel. We got treated with respect and as adults. The rooms were well attended to, staff friendly, and the beach and pool was peaceful with no kids around. Food was excellent for breakfast and dinner. make sure you get a room on the ground floor rather than the second floor, as you can walk straight out onto the beach from your room. Great location, excellent staff. Always ready to transport us to any location on the island and had excellent suggestions for activities, dining, etc. We had an outstanding experience at this resort. Great value for money. None. The entire experience was thoroughly enjoyable. The Beach Club is an excellent resort hotel. The staff were excellent at all times - timely pick-up at airport and return after our stay. Beautiful villa facing the beach - the downstair villas are the best! Beautiful island, enhanced only by the quality of the Beach Club! Excellent value for the money spent. Breakfast was great! Pool is lovely being an infinity. Great staff that will drive you anywhere and pick you up any where. All you do is ask any restaurant or retail outlet and wolla, they are there within minutes to take you back to the hotel. Great location also. As per the review title, this was the resort I stayed in for our wedding night. The bridesmaids all got ready here during the morning which included food for lunch and champagne. My husband carried me over the threshold and to our suprise, we entered our room that wasn't cleaned, there were glasses and plates, and serviettes and towels on the floor and the bed wasn't made. Very dissappointing given they saw me in the wedding dress leave. I thought they would have put a chocolate or champagne in the room as a little special gesture but I was sadly mistaken. This hotel is not worth the money, nor the 5 stars it apparently has. The Beach Club Resort is in a great location and I loved the no kids factor! It's central and very easy to get around the whole island with their free 24 hour buggy service. The staff will go out of their way for little obscure requests which we appreciated and the breakfast was great however, our room wasn't made up on our wedding day so you can imagine our disappointment when my husband carried me over the threshold to an absolute mess. This resort was advertised as a 5 star resort (the only one on the island) but I would say this is at best a 4 star resort. It is right on the beach, and the next star down is a 4 but family orientated, and the next one up is a 6 or a 7 but cost jumps about $1k per night so this is the best option however, I believe in managing expectations and if people book a 5 star hotel, they should get just that. This hotel is over rated, and over priced. Disappointing that Hamilton Island is renowned for weddings but there seems to be a sense of 'another one' rather than doing something 'memorable' for wedding couples.. at the very least, they should have cleaned the room. An amazing experience! Beautiful facilities in a breath taking setting. Highest quality of service from a wonderful staff who couldnt do enough and were happy to do so. We did not want to leave. Highly recommend staying here. Ottimo soggiorno serviti e riveriti da tutto il personale che è sempre gentilissimo. La cena sulla spiaggia purtroppo è stata fatta a bordo piscina a causa delle previsioni di forte vento, è stata ottima ma carissima! Op het vliegveld werden we ontvangen voor de bagageband en hoefden niet zelf op onze koffers te wachten (dat deed de porter). Inchecken verliep soepel en in de lounge in plaats van aan de balie. Op het hele eiland konden bij alle restaurants en winkels de aankopen op de kamer geboekt worden, dus nooit geld op zak. Gratis vervoer over het eiland en gratis watersportactiviteiten. IJswater, zonnenbrandmelk en handdoeken voor bij het zwembad en op het strand, maar helaas wel erg weinig ligbedden. Verwarmd zwembad en gratis internet (uitzonderlijk in Australie). Late check-out kon attenter. Lounge op luchthaven zonder service. 더할나위 없는 천국을 보여준 숙소. 신혼여행으로 너무 좋고 외국인 노부부가 다녀본 여행중에 최고라고 말할 정도임. 신혼부부라 더 없이 좋았던 숙소.